The design is a perfect match for the leaked build we got to play with a few weeks ago, and, if you ignore the action bar, a big improvement. 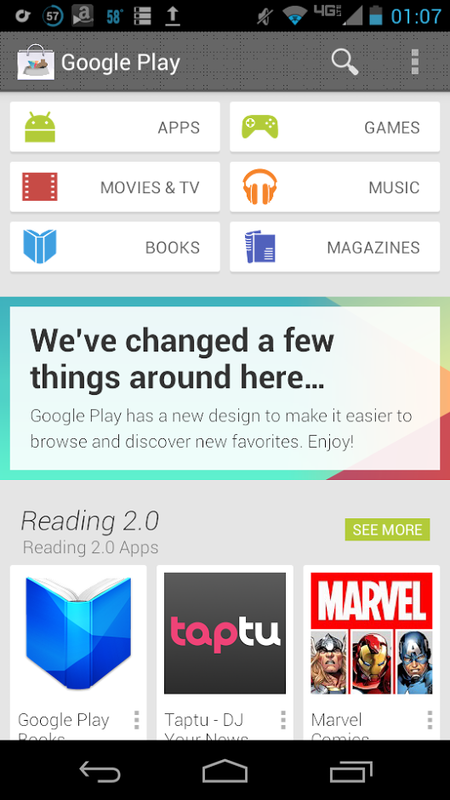 Of particular interest is the new Up button, which features the Play Store logo and a bone in a dog bowl. This is a reference to "Dogfooding" - a term Google uses to denote internal beta testing. Eileen probably shouldn't have posted this. We saved a copy when it went up, and, sure enough, it was deleted a few hours later. Each content section has gotten a new icon. They're now flat, 1 color designs, which we've never seen before. This is definitely further along than our leaked build. The ugly pixel "design" on the action bar is still present, but I think it's just a marking denoting that this is an unfinished build. I did a teardown of our leaked version and found the pixels were a separate element on top of the action bar, and could easily be removed. Extra layers slows things down, if this was a permanent design, they would integrate it with the color layer. That's it for now. We'll let you if anything else interesting comes across our virtual desks.